As if we didn’t have enough problems. After the Bounty Hunters and Cut Bane’s attack, the entire school was vandalized, the foundation was somehow even CRACKED, tables in the lunchroom were overthrown…in layman’s terms, McQuarrie was a dump. McQuarrie is about to be shut down. Closed. Bye bye, students. See you later. No matter what we’ve gone through here, be it weird advice-taking, or obnoxious Vader-shaking, or FunTime rebelling, I do NOT want this place to close their doors. It just won’t happen. something tells me that the end is near. So, enjoy. Today was horrid. Just before homeroom, I was in the library, talking with Kellen, trying to communicate with Dwight, and goofing off in front of Sara, when I glanced out the door of the highway and saw a person I thought I would never see again. Dr. Karl Blonsky, founder of FunTime. He was walking down the hall in the direction of the Principal’s office. Kellen caught my gaze and saw who I was looking at. “I have a bad feeling about this,” Kellen moaned. I nodded. This could end badly. I slunk out of the library, followed by Kellen and Sara and Harvey (They had noticed my worried glance as well). We stopped outside of Principal Howell’s office, and luckily the door was slighty open so we could hear what was going on. Dr. Blonsky slunk out of Howell’s office. He had an easel wth a large pad of paper with him, so this wasn’t a good sign. Us four walked into Howell’s office. He looked angry. I mean, more than usual. And that’s never good. “What was that guy doing here?” Harvey asked. “Then what was Dr. Blonsky doing here?” Harvey asked again. “We’re not gonna go back, are we?” Kellen asked, flabbergasted. We all grinned. This is gonna be fun. I got started in Art class. I told Remi about this whole thing, and how Tommy, after the talk, had commissioned me to make Penny Jar-Jar Binks, so I asked Mr. Howell (who is also the art teacher) if we could make Jar-Jar. He said we could after the lesson, which was making some really cool mosaics, and they didn’t take long, so we got on it really fast. Remi got a jar from a cabinet and I drew out the shape on an orange piece of paper. I cut out the shape and got a glue stick and went all over the back. I pasted it to the jar and Remi drew Jar-Jar’s face. She wrote ‘Penny Jar’ on the lid. We put it on the Art desk. Mr. Howell called the other students, who were working on they’re own stuff. Four kids got of their seats and dropped some coins in; 3 quarters, 1 nickel, 5 dimes, and 2 pennies. Hopefully, this was the start of something big. Even if it only started with a dollar and two cents. Sara, being the head of the fundraiser committee, asked me to be in charge of the movie night for the fundraisers. So, me and Lance rigged an old time projector thingy to the school (we used LOTS of extension cords) and got a bunch of Star Wars DVDs. So it was set. “So, can we start the movies now?” Lance asked at 4:00. “No. The time we’re setting it up is 8:00,” I said. Sometimes I just don’t know about that boy. LanLan really needs to start remembering things. So. We scrambled around trying to find a big white sheet to watch the movie on. Lance finally found one at my house and ran to the school (We live like a block away from the school). Me and Lance, with the help of Tommy and Sara, rigged the sheet in between two big trees. I turned the projector on to test it and it worked. By now it was like 7:00 (I took me 3 HOURS TO FIND A SHEET!!!!) and everything for the actual movie was ready. I had asked Kellen to make a really awesome poster at the front of the school for advertisement (of course showing the admission fee of $2.00 a person) and Tommy had set up a toll booth in front of the movie. It looked really good. Suddenly, Lance came running up to me arms waving. “WE HAVE NO POPCORN!!! !” He yelled. I face palmed. That was my responsibility. And with the whole sheet thing, I had completely forgotten. it was 7:30, and people were arriving in 30 minutes. Dwight, who had come out there and was just watching us while trying to stick his entire hand in his mouth, apparently heard our problem, and came running up. Origami Yoda was already on his finger. “To the kitchen you must go!” Dwight pointed to the kitchen’s back door, which was several feet away. “To the kitchen you MUST go!! !” Origami Yoda screeched. Me and Lance walked up to the door, and just as I was about to knock, Lunchman Jeff walked out. He held several bags of stuff. “Hi LJ! What’re you doing here?” Lance asked. “Oh, sure! I’ll go pop it! And I have some seasoning somewhere….” LJ closed the back door to the kitchen. He came back 15 minutes later with several bowls of nice fluffy popcorn. I nodded to Dwight, who was again trying to stuff his hand in his mouth. Needless to say, our movie marathon was a hit. We made $46.00! That was a nice edition to the fundraiser. McQuarrie is that much closer to being saved. Admittedly, the idea to have a Star Wars marathon in McQuarrie’s front yard was good. Even Howell tuned in for the short time that it was on. But some other people didn’t think so. Like, ten minutes into Episode 1, this black limo drives up, and this guy who looks really business-y climbed out. He had sunglasses and his hair was gelled and whatever. He walked up to the projector we had running and turned it off, at the exact moment that Qui-Gon throws Jar-Jar under the MTT (I still think that Qui-Gon should of just left that sorry excuse of a Gungan anyway). All the parents and kids watching turned around, saw the guy, and started complaining. Then the guy grabbed the cash register that Tommy was using in the toll-booth, emptied it into his pocket, and turned around. “Hey! What’s the big idea?” I yelled. He sighed that grown-up sigh they have when they think a kid doesn’t understand something, and they think they do. “You are airing a copyrighted movie without the consent of the company. And you are making people pay to see it,” He replied. “Letting it pa- I had no idea about this, and niether did they!” Howell growled. “Sorry Grouchy. Here’s the bill.” He handed Howell a slip of paper and walked back into his car and drove off. He is officially on my most despised people list. Top 2. Right under maybe Soapy the monkey. Mr. Howell sulked back to his seat and told everyone what had happened. Then another car drove up, one with Gizmo and Prof. FunTime plastered on the side door. “Oh Bantha dung,” I groaned. Suit Guy—oh great—stepped out and he looked all spiffed up. Y’Know, I would bet Darth Paper that he was the guy that phoned “Greg Farty” down here in the first place. “Howell, I heard you got fined again?” Suit Guy asked blandly. “Please, take my offer. It’s the best one you got. I mean, these kids aren’t doing anything to change their school. But the Edu-Fun system can.” We all wanted to punch him. Okay, he replaces Greg Farty as the 2nd. “Fine,” Howell sighed. We all gasped. This wasn’t good. We slunk into class the next day sulking about the night before. FunTime of course had not arrived yet, and we had a few moments to hold our breath, but we couldn’t shake the fealing that we would have to face the insidious calculator again. Even Mr. Howell was even angrier than usual. He didn’t say anything though. So all of the former Rebels met in the library after school. “We need to shut down FunTime for good,” Mike said as he slammed his fist down on the library table. “We need to get serious with this fundraiser. We need to combat Edu-Fun’s FUNdraiser for real now,” I said. “But that’s tonight!” I yelled. I turned to Dwight. Origami Yoda sat on his finger just waiting for a question. Cheers went up as they held up the Rebel Alliance puppets. I forgot the sensation of leading my friends into battle. It gave me a sense of pride that they, including Harvey, follow my leadership. The Rebels were back in action, baby! I feel exhilrated. It has been forever since I held Anakin SkyFolder. It feels so good! We walked in to the high school. So many things had happened in the high school’s library. Dwight’s banishment, the Rebel Attack, Rabbski saving the day. But today they had their stuff in the giant gym they have. And today another event would happen; Edu-Fun would be completely and utterly destroyed. Howell led us to our seats, and told us to behave when our thing came about. It was only the four of us; me, Tommy, Kellen and Sara (no Dwight and Paperwad Yoda), but we still stood tall. There were a bunch of folding chairs spanning the entire gym, and the lights were off, except for several trained on the stage, which made them look like spotlights. Suit Guy stepped onto the stage. He straightened his tie, and started talking into the mic. A bunch of people clapped as the other guy, Dr. Blonsky, walked onto the stage. I thought I’d never see him again. “Thank you, Charles. This fundraiser is for schools who have seen better days. At Edu-Fun, our focus is not only on helping students with our FunTime program, but it is also helping the schools themselves and paying for any damage to the school or school property. Today the schools we are volunteering to help are Nolan and McQuarrie Middle Schools. But of these two schools, our main focus tonight will be on McQuarrie. Before anyone could say anything, Howell nodded to Tommy. That bald kid stood up with as much dignity as he could muster (and believe me, there wasn’t much dignity in him to begin with), and at the top of his lungs, shouted “NAY!” Blonsky turned his head in Tommy’s direction. Tommy interrupted him, got up from his seat, and ran up to the stage. “The reason you do these fundraisers isn’t for the school!” Tommy yelled, really angrily. “Young man, sit down this instant!” Suit Guy yelled. He was getting mad. This wasn’t going to end well. “Yes, because everyone wants to see Gizmo in 3D!” another man groaned. Soon enough, everybody got up and started spouting different reasons that FunTime is horrible. (Pretty much what we’ve been trying to say since the beginning). Dr. Blonsky looked like he wanted to crawl under a rock. I could see Mr. Howell giving us the thumbs-up. “WORKSHEETS!!!! !” Everyone in the room yelled. This would be a day long remembered. It has seen the end of FunTime, and soon it would see the end of Dr. Blonsky. Everyone followed his orders. It was actually very fun to watch. You go, hon! A little bit later, after everyone had left the gymnasium, the four of us stayed behind as we waited for our parents to pick us up, with supervision from Howell, who was talking with Suit Guy. “That was awesome!” Kellen exclaimed. He started humming Yub-Nub. Harvey joined him. “So, that was interesting,” Tommy said as he turned towards me. We sat on the stage, legs dangling. “You were pretty great up there,” I told him. He blushed. “Really?” I realized I was blushing, and tried hiding it by brushing my bangs in front of my face. I saw my mom walking up to Howell and Rabbski, and she started talking with them. Just before she came in, I kissed Tommy on the cheek. His face got even redder than mine. “See you tommorrow,” I yelled over to him as my mom took my hand. “See ya,” He replied, but his voice was a few octaves higher. So, even after all of that, there was no money left to save McQuarrie. It was time to face the facts. Our school was shutting down. It was Friday, a few days after the Edu-Fun meeting. Once this weekend was over, it would be our final week at McQuarrie. Mr. Howell had even had a general assembly about how we should figure out which schools we would transfer to and sent home a slip of paper for the parents to decide with us which school would best suit each of us. I sat in my room for a long time, just thinking about the school and what had happened there. Dwight and Origami Yoda. Harvey and Darth Paper. Sara and the Fortune Wookiee. Mr. Howell and Jabba the Puppett. Mrs. Rabbski and Princess Labelmaker. Tony and Jango Fortune. Emperor Papertine. The Bounty Hunters. Cut Bane. And of course, the FunTime Menace. (Which, I might add, is finally over. After the backlash on Tuesday night, all the school teachers in Lucas County realized how terrible the “FUN” products were, and the entire Edu-FUNpire had closed down for good, meaning that every single product manufactured by that company was gone for good. Another part of the prophecy was fulfilled, too. 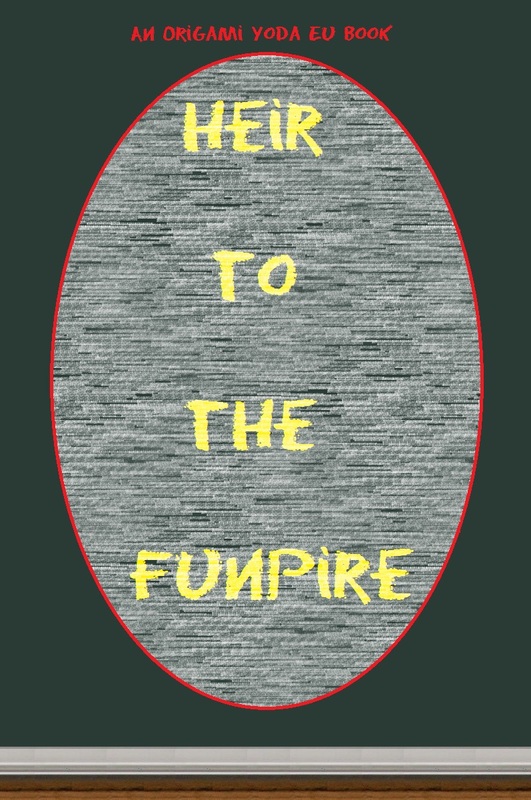 “The return of the dreaded FUNpire” had been counter-attacked. Perhaps FunTime was “Yoda’s Bane,” and another piece of the prophecy was fulfilled too. I’m not sure. But the big thing we had to figure out was the mystery concerning Vernon’s partner and Cut Bane. We only had one week left at McQuarrie before it closed and Origami Yoda died, according to the prophecy. One last mystery. One last week. One last case file. And I will be writing this one. Look forward to it. Oh totally!! (I was working on editing in Grand Admiral Drawn, but I couldn’t find one online). And thanks for noticing, Eggbert! Yay! Thx for puting me in this one! Can I be in it? And Ep20, too? Oh yes! I just came up with the ending for your character’s story arc last night, and I think you’re really gonna like it! Have EVERYONE (except the Tolkien gang since they aren’t mentioned much anymore) in the last Episode. My character included, por favore. Hey, JC and EU crew. I have an idea that will blow you away. JC, WRITE THE STORY PLEASE!!!! FUNpire is almost done, guys! FUNpire is done!! Well done, D.N.!!! Now, THE COUNTDOWN BEGINS TO OUR DESTRUC- I mean, TO THE PROPHECY FULFILLED! Yeah, that’s it.. So wait is my Quinlan Folds mini story going to be made. wait. if ”The End This Is?” is coming in 9 days what about the eu? I think it’d be best if you wrote that story. The EU won’t be closed down or anything. The stories that are up will still be available to read afterwards! This is so awesome! Thanks for all the replies! JC, did you get my stories? Yup. For a story like this, I want to be included. And give me a origami Plo-Koon. Unless Zack has Plo Koon…. Then, I’ll just take…. Eh, what the heck, Coleman Trebor. We’ll see, guys. I can’t get everybody in this story. That would be insanely difficult! You guys forgot to put Emperor Pickletine! Infact, hes missing in lots of the stories! This is SF OrigamiIsStooky (on my G+ account). Anyway, SF D.N., great story, but Kellen was never with Remi. If you read Pickletine, you should know that Kellen was with Cassie and Remi was with Ben.